One day she saw their Subaru in the distance and figured Rauch was also casing the neighborhood. But it was Marcus, driving through because he badly wanted the family to find a Rummer of their own. 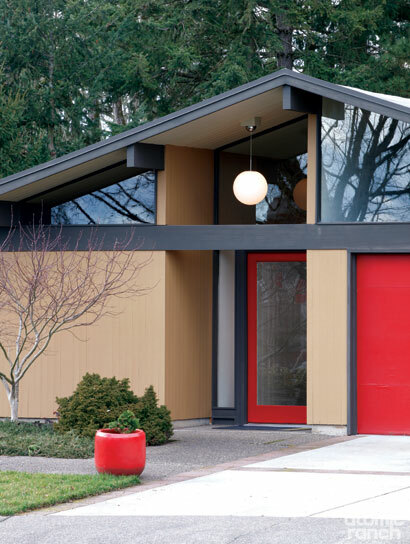 With only about 30 modern homes in the postwar tract of 600, Rummers rarely went on the market. “We heard this house was going up for sale, so we came over and knocked on the front door and asked to see it,” Rauch relates. They phoned their realtor and put in an immediate offer, but the seller went with another buyer. Luckily that deal fell through, and in 2004 they were the new owners of a four-bedroom, two-bath ranch built in 1967. 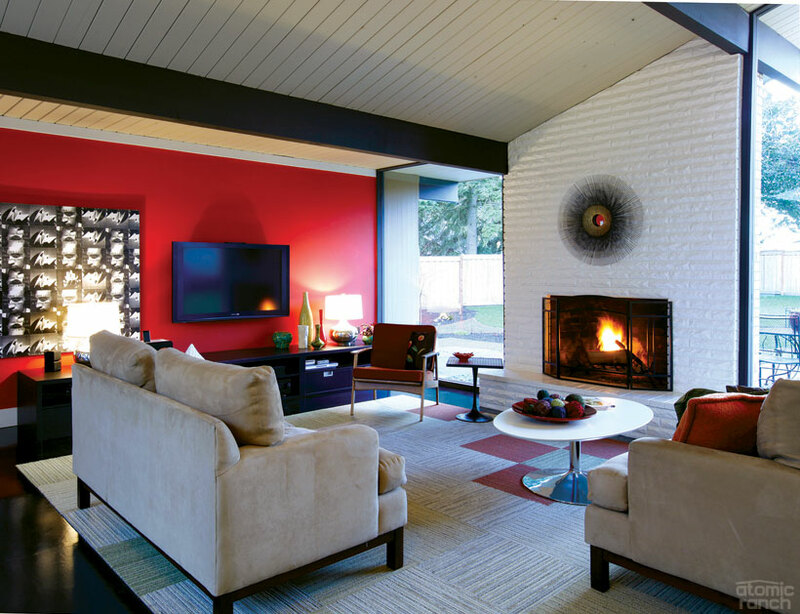 The 1967 Rummer ranch shows a classic modern roofline and red accents give the exterior some jazzy contrast. Robert Rummer built lots of houses, many of them quite traditional, in and around greater Portland. But it’s the modern Eichler cousins that people refer to when they talk about having a “Rummer.” He reminisces about meeting A. Quincy Jones and working with draftsman and architect Toby Moore but doesn’t directly answer the “Are your homes based on Eichler floor plans?” question. He talks about how developers, architects, draftsmen were all influenced by Frank Lloyd Wright’s post and beam designs, and how they all borrowed from each other’s work. He also tells how his wife, Phyllis, pointed him toward unabashedly modern homes when she fell for an Eichler in the Bay Area. 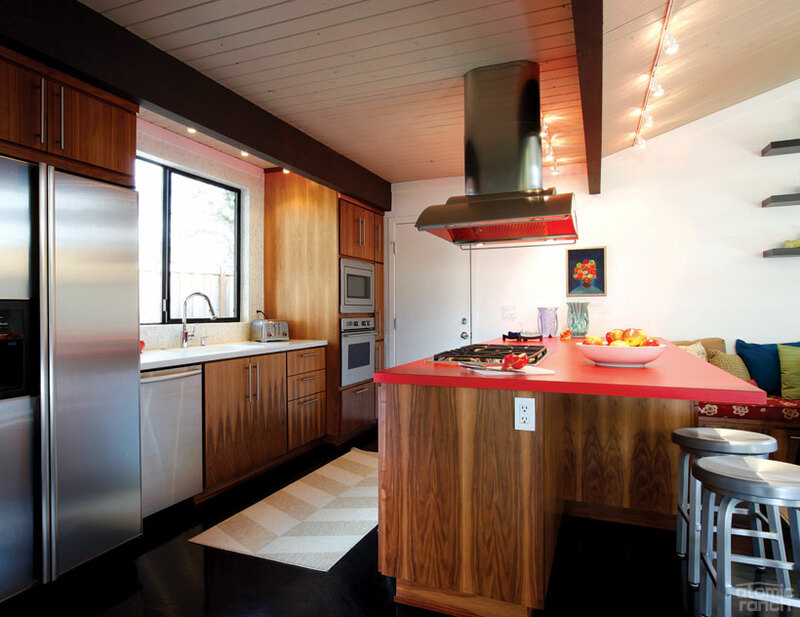 But it wasn’t until Bob saw the same Eichler model in Look magazine that he understood what she was enthusing over. 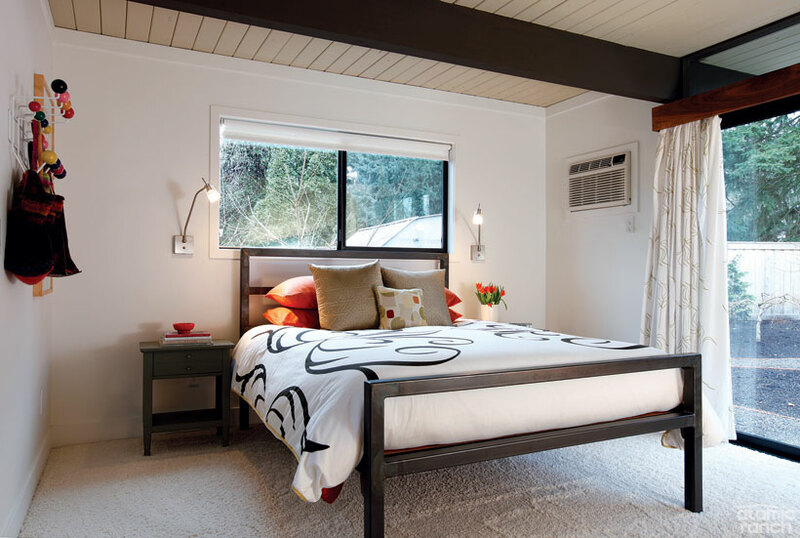 The master bedroom has the only air conditioner in the home, but sliding glass doors and windows make it pleasant all but a handful of 100°-plus days. 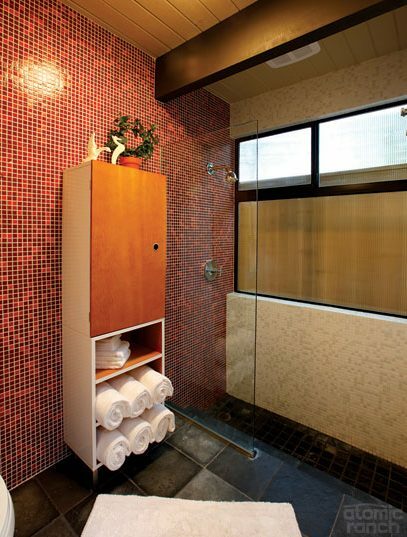 Tessa’s bath is tiled with glass mosaic from Hakatai; the wet room houses the tub and toilet, while the sink is in the hallway nearby. Because Root is the primary breadwinner, Rauch was able to work full time on the project from July to November, jumping in to demo, dig a 150’ trench for a new electrical service and install things like trim, light fixtures and switches. A personal plus was all the keen tools he needed to perform these tasks: “My record is five times at Home Depot in one day,” he laughs. Though the couple communicates in shorthand, that wasn’t the case with their contractor, Matt Endler. “Take the lights: He thought they looked so cheesy and old—he was all over me, ‘Are you sure you want those lights?’ But pretty early on he understood that I knew what I wanted and it wasn’t that I was dithering back and forth,” she says. Once formally divided into a kitchen and family room, the cooking/dining area has some populist features—the stainless steel GE Monogram appliances and track lighting—and some unusual details like the vintage McCoy pottery and riot of throw pillows on the banquette. The aluminum stools are from Crate & Barrel, Ikea dining chairs surround a Room & Board table and overhead is one of the oversize pendants Root specified for the remodel. In the former dining room, a wall between it and the kitchen came down during the remodel. The couple would love to upgrade the overstuffed armchairs from their McMansion library with two walnut and white leather Eames lounge chairs. One area where Endler’s vote prevailed was in the kitchen cabinets. “We didn’t think we could afford custom cabinets—it was turning into a money pit—so I did a design on the Ikea online kitchen planner,” Root says. The Ikea layout that Root did formed the basis for Tom Kimlinger’s custom work; they only needed to plan some additional drawer layouts and a wrap for the L-shape bottom cupboard. “The man is a god,” Root enthuses. They contemplated a $10,000 chunk of Corian for the exceptionally deep main counter, but instead used that to surround the sink and went with orange laminate for the cooktop area. “Laminate is so affordable that if we tire of the color, it’s not very expensive to replace; it’s like the throw pillow of countertops,” Root says. The paint for the orange walls in the living room and the office was matched to the kitchen laminate. The neutral linens and Room & Board bed are punched up with colorful pillows and an Eames Hang-It-All on the wall that corrals textiles and purses. 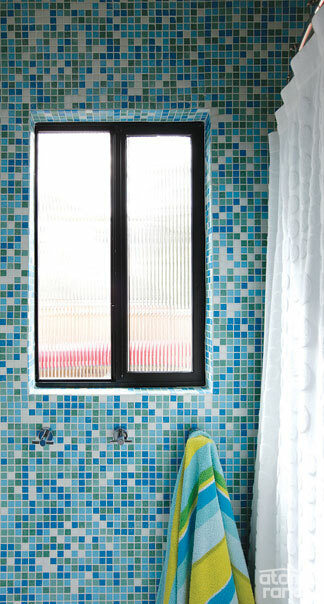 The original sunken Roman bath remains in the master bath. 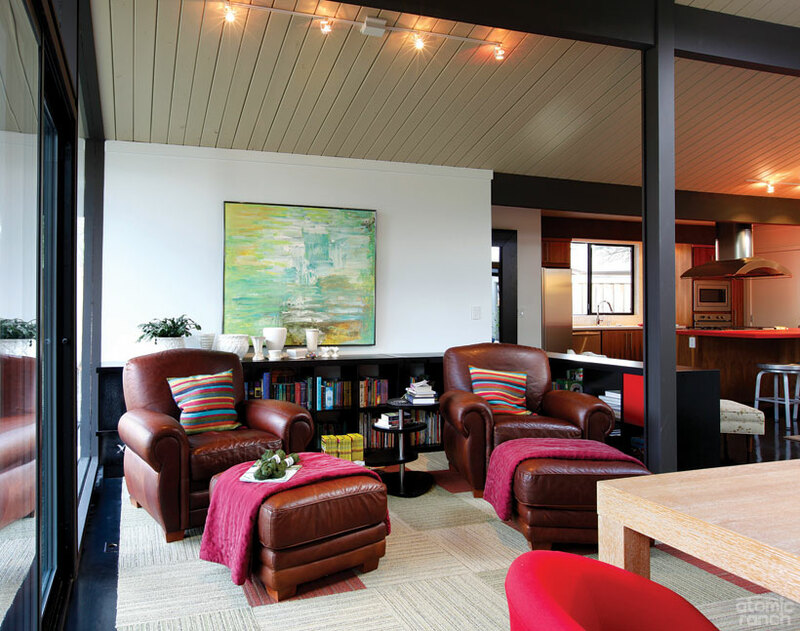 Atomic Ranch first met Mr. and Mrs. Rummer during an Oak Hills home tour, and one wonders how the various renovations they see today sit with them. Bob, in particular, appears to thoroughly enjoy the current attention, and both seem interested in how a new generation is interpreting their homes. Phyllis was always involved in the business and helped choose the original earth-toned color palettes of the houses. Bob notes that men were particularly drawn to his designs, with young doctors and engineers being typical buyers. They were both quick to praise the Root-Rauch remodel. Two elements that make a Rummer a Rummer are the sunken Roman tub in the master bath, which the couple retained, and fiberglass roofing in the atrium. 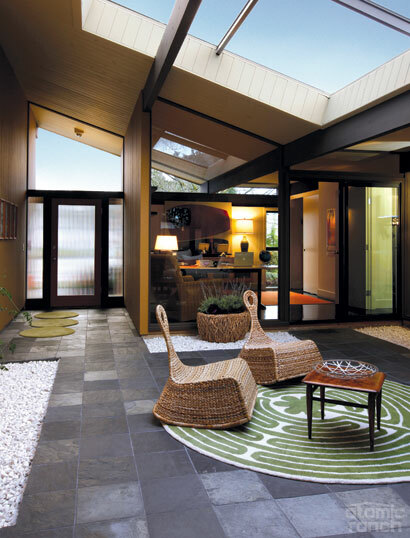 By the time they bought the house, the atrium had operable skylights instead and that upgrade makes for a split-personality room: It’s protected from the rain yet unheated, and the natural airflow in the summer makes all but the hottest days pleasant. The family uses the space as a reading room, entry hall and circulation shortcut. Rauch and Tessa pursuing separate activities just a few feet apart. The paint for the orange walls in the living room and the office was matched to the kitchen laminate. The fiberglass skylight in the atrium is a characteristic feature of Rummer homes. With Oak Hills’ bucolic master-planned green space, elementary school, pool, church, RV lot and camaraderie, do they miss their big McMansion? Not a bit.